Brandon had to make a science project out of recyclable materials. 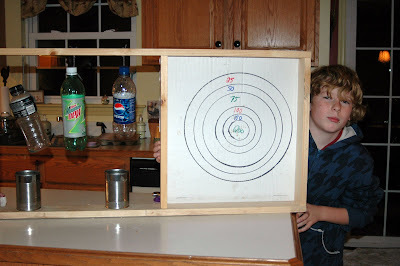 He used wood, plastic, tin can and a cardboard pizza box. If you can't guess: it is a target practice for his air soft gun. What a perfect post for me. My boys had air soft guns on their small Christmas list this year. I was so against getting them one, but finally broke down and got them each one. Can you shed some light on these guns? Am I going to be in the ER on Christmas? We got Brandon a mask with his gun. So far we haven't had any problems. Brandon and a few other boys in the neighborhood run around the woods behind our house, made some forts and shoot each other. We layed out ground rules and even typed up a contract for Brandon. If any of the rules are broken, the guns are taken away. ie: no shooting the face, no close contact, etc.